Estate cars have never looked better, and the new Mazda CX5 Estate is a case in point. Striking in its design, it makes for an excellent transition for growing families who need something bigger than a Hatchback. And just in case you were worried all Estate cars were boring, Mazda’s all-action DNA is present. If you’ve ever driven a Mazda MX-5 Roadster, be sure that this muscular Estate has taken a few cues from its devil-may-care sibling. It’s well equipped, too – but it is expensive. OSV takes a closer look at what it’s all about with our 2017 Mazda CX-5 Estate review. If you’re looking for an SUV that’s good fun to drive, you don’t need to look beyond the CX5. It’s bigger than a Ford Focus, so offers more practicality. But it’s still just as entertaining to drive. This is great news for anyone making the transition to a more grown-up car, but who still wishes they were driving a zippy Roadster. It’s surprising how well it drives. After all, the science is not exactly on its side. Make no mistake, this is a large car that has to keep its brakes, suspension and steering well controlled. It does this well, and offers an engaging driving experience. The steering is nicely weighted and precise, and the tyres provide ample amounts of grip. The CX5 will lean in corners more than a Hatchback, but we wouldn’t say it’s a massive concern. It’s liveable. Moreover, this is one of the nimblest large Estate cars on the market right now. Instead, our biggest concern is with passenger comfort. Thanks to hefty alloys, the Mazda CX5 Estate isn’t the comfiest car on the road. In terms of its engines, not much has changed from last time. A 2.2-litre power plant is still the sole diesel offering, and it’s available in two power guises. You can get it with either 148bhp or 173bhp. It’s a familiar engine to Mazda buyers, and is used in a few other models. It’s been tweaked this time around, with the 173bhp variant now smoother and quieter. It’s still got plenty of pulling power up its sleeve, and can do 0-62 in 9.0 seconds. It’s our top pick – it’s both responsive and keen to rev. We like the 6-speed manual transmission it’s wed to as standard, too. There is the option of a 6-speed automatic, which improves fuel economy while bumping up the list price. The only other engine in the range is a 2.0-litre 163bhp petrol. Like the diesel, it has four cylinders and works together with a 6-speed manual ‘box. It costs less to buy than the diesel, is quieter, and probably won’t cost much more to run. It’s slower, though, taking 10.4 seconds to cover the 0-62 dash. 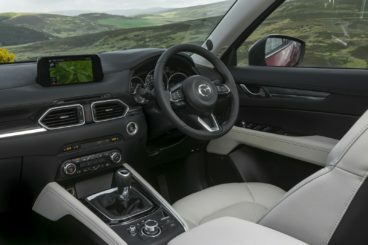 Inside, the Mazda CX5 has an upmarket feel to it. To compete with its rivals, Mazda knew they had to up their game in this department. Small changes, as opposed to a total overhaul, have been the order of the day – and it’s just what the doctor ordered. It’s quieter and smoother now, with barely any exterior noises getting indoors. The dashboard has more flair to it. As well as looking better, tactile materials have helped to make it feel better. There wasn’t too much wrong with it last time, but it’s got more pizzazz now. A new 7” touchscreen infotainment system has lifted its appeal, too. A rotary controller is neat and modern, and it’s removed the need for excess buttons. The surfaces are softer, while chrome highlights have brightened what was a too-dark dashboard last time. When it comes to practicality, the Mazda is a bit of a letdown. It’s a big car, but can’t offer any more interior space than the smaller Mazda 3. Rivals certainly have it beaten in this department. This is largely due to its unusual svelte shape. Mazda have made amends with a few intelligent storage solutions, such as a massive glovebox and a useful central storage compartment. However, its boot is only three-litres bigger than last time. Measuring 506-litres, it’s miles off the class-leaders. The listing price is quite high, but you get a good amount of standard kit. Included with the entry level model is sat nav, LED headlamps, a DAB radio, twin-zone climate control and 17” alloys. The only other model is the Sport Nav. This adds power-adjustable heated front seats, a 10-speaker Bose stereo, and a leather interior. It also gets bigger 19” alloys and a colour heads-up display. Where safety is concerned, we have no concerns. It hasn’t been crash-tested by Euro NCAP yet, but we expect it to achieve the 5/5 score of its predecessor. Autonomous emergency braking is included in the standard safety kit, as are air bags and traction control. However, only the Sport Nav model gets blind spot monitoring and an enhanced autonomous emergency braking system. Prices for the new car start out from £23,700 and rise to £33,200. For more information on our leasing deals, check out our page here. In terms of its running costs, the Mazda CX5 Estate is competitive. If you’re making the transition from a smaller Hatchback or even a city car, the costs won’t hit you too hard. The most frugal engine in the range is the 2.2-litre 148bhp diesel when paired up with two-wheel-drive and a manual ‘box. It returns 56.5mpg, and emits 132g/km of CO2. Adding four-wheel-drive lowers its economy to 52.3mpg, which is still decent for such a big car. However, choosing the automatic transmission sends costs tumbling to 48.7mpg at best. The 2.0-litre petrol engine, meanwhile, averages 44.1mpg according to Mazda, and emits just less than 150g/km of CO2. Whichever model you choose, your yearly road tax bill will be £150. Mazda is renowned for producing exceptionally drivable cars, and this sizeable SUV is no different. If you’ve got to put your Coupe dream on hold for a while, the CX5 is a good stop-gap. It’s not quite a go-anywhere 4×4, but it’s solidly built enough to cope with the needs of growing families. Last time around, the cabin was poor. It’s now much more upmarket, with Mazda adding upgrades and better tech. It’s spacious, but can’t compete with some rivals in this area. There are only two engines to choose from – a diesel and a petrol. And because the petrol literally sweats fuel, the diesel will be the easy (and pretty much only) choice for most buyers. 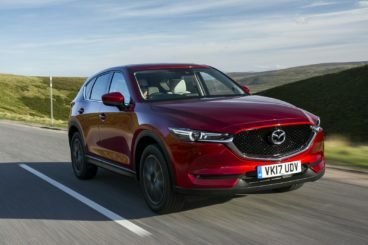 Let’s see how the car fares against its rivals in the comparison section of our 2017 Mazda CX5 Estate review. The new Peugeot 3008 is another stylish offering in the large family car sector. Hugely popular, it boasts excellent levels of practicality and a classy interior. Despite its considerable frame, it’s also simple enough to drive. Comfortable and competent are the words we’d use to describe its driving performance – words that should speak to growing families. Visibility is good, and ride quality is perfect. It’s not a bundle of fun, but it is engaging. With that in mind, we think it should also appeal to keener drivers who need a bigger car for the family. There are a few engines to choose from, including two petrols. A 1.2-litre 128bhp kicks off the range, and does 0-62 in 10.8 seconds. It’s the cheapest option, and because of its smoothness, a more-than worthy option. A more powerful 1.6-litre petrol is swifter and keener, and does 0-62 in just 8.9 seconds. However, it’s the 1.6-litre 118bhp diesel engine that’s expected to be the top seller. It’s more of a mild-mannered cruiser that takes 11.2 seconds to complete the 0-62 dash. That seems rather leisurely, but it’s much quicker than the 99bhp diesel, which takes almost two extra seconds to cover the same dash. A bigger 2.0-litre diesel engine is also available, but the 118bhp makes economical sense. It returns over 70.6mpg fuel economy, and emits just 104g/km of CO2. The 99bhp emits 99bhp, while the beefiest 2.0-litre 178bhp diesel returns 58.9mpg and emits 124g/km. Inside, we can’t find fault with the Peugeot 3008’s interior. It’s a 5/5, an A++ and demonstrates how far this class has come in recent years. Soft-touch plastics are everywhere, the textured cloth is a highlight, while the frustrating ergonomics of old have been improved. And for convenience and style, the steering wheel has been shrunk so that you can see the dials behind it much easier. Peugeot’s i-Cockpit is now standard on all models, and it’s a highly welcome addition. It’s 12.3” digital display dispenses with traditional buttons and dials, such as the speedometer. You can also use it to configure your media playlists and sat nav. So it’s a bit of a showy, techy interior – but it’s also practical. Four people can easily sit in comfort, even if the 3008 is not as large as the Mazda. It cocoons you rather than lets you stretch your legs without a care in the world. It’s more than enough space, though. The boot, meanwhile, measures 520-litres. Fold the rear seats and you can extend it to 1,580. 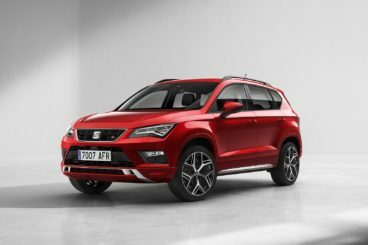 The new SEAT Ateca is a reasonably priced large family car that looks every inch the tough cookie it is. It’s good to drive, practical and represents a more affordable alternative to the Mazda. Composed and performative, there isn’t much wrong with the way the SEAT drives. Its steering is price and light, and it’s relatively quick. The suspension isn’t the softest, but it’s not so firm to be a deal breaker – unless you go for the bigger 19” alloys, that is. It’s a characterful that can change its mood depending on your mood and the conditions. Using a centre console switch, you can modify its steering weight, the speed of its gear shifts, and its accelerator pedal response. There is a good selection of engines to choose from. A 1.6-litre diesel opens the range, and may be the best available. It’s got lots of shove, does 0-62 in 11.5 seconds, and has enough power to cope with a full load. The bigger 2.0-litre diesel is on offer in either 148bhp or 187bhp, with the latter doing 0-62 in 7.5 seconds. That seems unnecessary for this type of car, but it just highlights how much performance it has. This diesel also gets four-wheel-drive as standard. The petrol range starts with a small three-pot 1.0-litre engine that’s taken from the VW Golf. It’s smooth and noiseless, and offers more bite than you might expect. However, the SEAT Leon-derived 1.4-litre TSI petrol engine has broader appeal. It produces up to 148bhp, does 0-62 in 8.5 seconds and delivers its power without any hassle. Economy is good across the board, with the 1.6-litre TDI diesel the most frugal. It returns 65.7mpg, and emits just 113g/km of CO2. The bigger 2.0-litre diesel can return 55mpg at best, while the 1.4-litre petrol benefits from deactivation technology to average 53.3mpg. Inside, the Ateca is handsome and inviting. It reminds us of the SEAT Leon – but better. It shares similar features, but gets a few upgrades. For example, a rotary dial now lets you easily flick between driving modes, while a large touchscreen dominates the dash. Other than that, you get the same heater controls, easy-to-use dials – and choice low rent plastics. That said, the quality is generally high. On the practical front, the SEAT Ateca SUV excels. There is room for five people, access is easy, and the boot measures 510-litres. That’s a shade bigger than the Mazda, while a shallow but wide underfloor storage section enhances practicality. This is one of the best Crossover’s money can buy right now. There – we said it. It’s just a joy on so many levels, from the family friendly build quality to the upmarket interior, to its sharp handling and even sharper looks. The new Mazda CX5 can now compete with rivals, and in many ways it feels a lot better.